​The Short Volatility Trade. A Gold Mine or a Russian Roulette? The Credit Suisse VelocityShares Daily Inverse VIX Short-Term ETN is a security designed to replicate the inverse of the famous VIX index. Basically, buying XIV you will get a short position over implied volatility for S&P 500 options in the next 30 days. 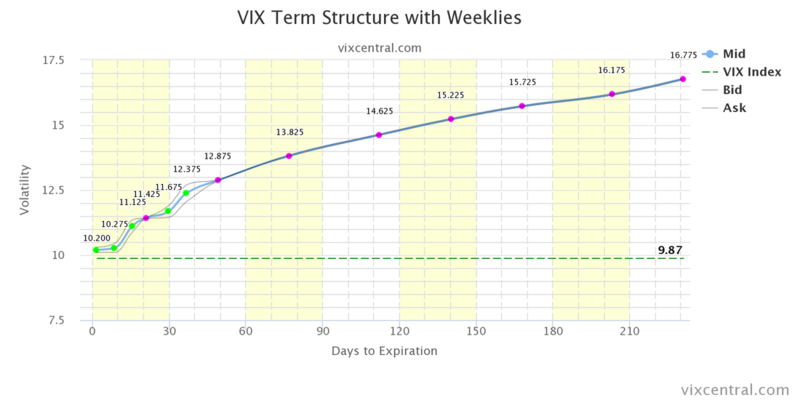 To do this XIV is structured as a portfolio of short VIX futures with weighted average maturity of 30 days (e.g. 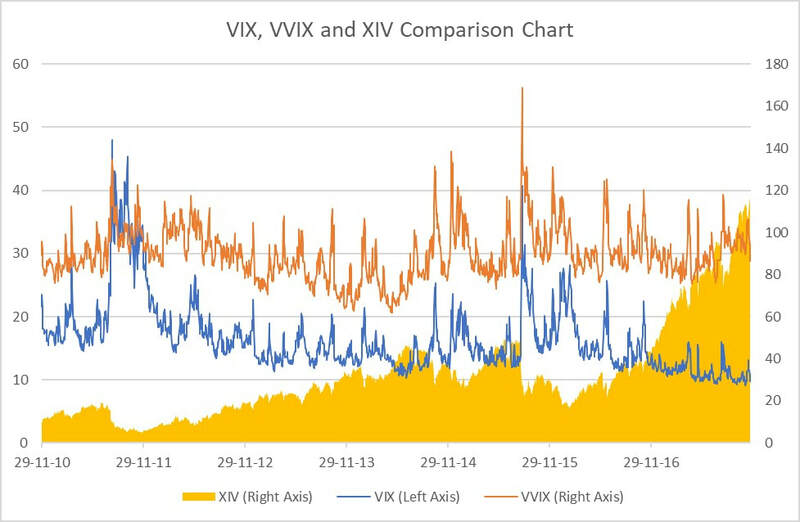 at the time this article was written, November 24th, XIV was composed by 32% VIX futures with maturity in December 2017 and 68% with VIX futures maturing in January 2018 providing a weighted average maturity of 30 days). The long volatility peer of XIV is VXX which is composed of long futures on VIX with 30 days average maturity, thus it is more correct saying that XIV the inverse of VXX rather than the index of the VIX. Holding an unhedged position in XIV, given that VIX is a hyper-volatile volatility index, (the reader will excuse me for the word pun and can look at the VVIX, also called the VIX of VIX, to get an idea of the extreme volatility I am referring to) is certainly very risky but also a potentially very profitable trade idea. The XIV is growing interesting for investors and financial newspapers as it surged dramatically thanks to the record-low volatility in markets. XIV has already achieved a 124.73% return in 2017 and its surge seems unstoppable. This incredible performance is mostly to be ascribed to the enormous amount of liquidity pumped into the markets by central banks around the world, especially the Fed, which basically killed volatility in stock markets since its beginning in 2009. If in 2008, when VIX traded above 60, you asked any trader if she was going to see the VIX below 10 in her lifespan she would probably have said no, well in 2017 we saw the VIX closing below 10 (which means that the market expects a 10% annual standard deviation in the next 30 days) in many occasions with a 9-days streak in July and an 8-days streak in September-October. We must go back to the booming stock market of the ‘90s to see something like this. But today we are not going to forecast what the VIX will looking like in the future, our trade idea is based on the VIX term structure which presents some peculiarities compared to other instruments term structures (commodities, interest rates or any other asset). 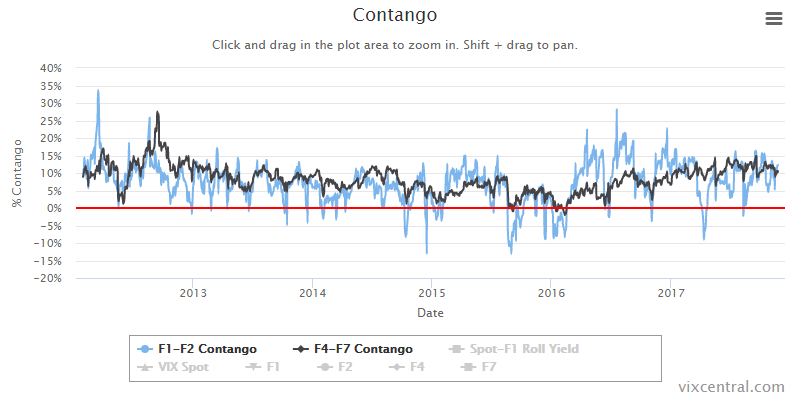 It is glaring that the futures market for contracts with the VIX as an underlying asset is VERY in contango, and, historically, it has been like this most of the times except in periods of extreme market panic when the VIX dramatically surging above 40 (e.g. 1987 Wall Street crash, ’00 Tech bubble, 2008 Lehman Chapter 11 and sovereign debt crisis of 2011). The reason behind this contango is a matter of debate but many believe this is because investors use put options as a portfolio insurance paying premiums proportionate to, most of the times, higher volatility than what it is going to be realized by the market. Also, option sellers charge long term volatility premiums which are typically higher than the current VIX value. Long story short, expected volatility is almost every time higher than historical volatility. Moreover, the VIX is believed to be, and it has historically believed like, a mean reverting index. Mean reversion is a statistical concept meaning that such a variable starts to move back to some value, like the historical mean or any other value believed to be the “normal” value for the variable, when moving too much up or down from it. The “normal” value for VIX is a matter of debate but most investors believe this to be in a range between values of 15 and 20. Finally, what I am trying to say is that, overall, the VIX cannot assume, like for example a stock, any positive value, but it will always fluctuate between some upper and lower values (whatever these values will be is highly uncertain and unforecastable). That is, we are not going to see the VIX at 0 or 1000 in any scenario. Basically, systematically shorting VIX futures generates huge returns, thanks to the high time-decay of the premium implied in the term structure, when the market is in contango like it is most of the times and the mean reversion of the VIX which prevents the VIX from moving in a permanently upside or downside direction. The reader will notice that the term structure is steeper for short term futures meaning that this kind of trade is more profitable when the contracts shorted are the ones with the shortest maturity (F1 and F2 in the graph below indicates futures with maturity of 1-2 months). But a trade like this is indeed incredibly risky, ETNs like XIV are set to experience huge drawdowns when the market starts to behave nervously or enters periods of panic, with large spikes in VIX. If we can sustain such drawdowns in the short term we are very likely to see huge returns in the long run thanks to the contango of the term structure. There is also a concern about the possibility that XIV can be folded in occurrence of extreme scenarios when the VIX rises so high and sharply that the value of the fund reaches 0 making impossible to keep the strategy going. This is increasingly likely when VIX is low as it is possible for it to double in few hours (e.g. it is more likely for the VIX to go up from 9 to 20 than it is from 40 to 80). In fact, VIX went, theoretically, from 30 to 150 during the ’87 stock market crash. XIV also embedders a covenant forcing the underwriter, Credit Suisse, to start liquidating the positions when XIV is down more than 80%. This is even worse than it seems as such an event often happens in dry market situations when you are likely to get horrible prices while trying to sell the position as fast as possible. In bad times things are also much worse for short volatility traders as the term structures tends to invert into backwardation as volatility spikes making ETNs like XIV losing money incredibly fast. A strategy which implies lower risk, but also lower profits, is going long on the ZIV ETN which is constructed basically identically to the XIV but instead shorting Medium Term (5 months average maturity) VIX futures which are subjected to less volatility and are almost never in a backwardation term structure. A huge con for ZIV traders is that liquidity is much smaller than the one for XIV often creating huge spreads and transaction costs. The long volatility peer of ZIV is VXZ. Many investors do not buy and hold this kind of futures, but they offset most of the market risk using VXX and VXZ as a hedge for XIV and ZIV position respectively trying to generate alpha and reducing the magnitude of possible drawdowns. We learned that shorting volatility can be very profitable when the market is calm like in recent years, short volatility traders thinks that a low volatility environment is the new normal and this trading window is here to stay allowing them to retire with a little pot of gold. But just as the low volatilities of the ‘90s and 2006 seemed the new normal, they eventually gave way to massive increases in volatility, and so will this market – eventually. That is, the more the short volatility trade becomes popular the more is going to be the pain when the volatility will awake from its long sleep.